It's only been two weeks since the Arsenal game (and five since the Capital One cup final) but both seem an age ago. With both Swansea and Spurs coming off multiple successive defeats, the international break arguably came at a good time to provide a gap between what's gone before and the final part of the season. As mentioned in the review of the Arsenal game, there's no shame in losing to a team of that calibre but it certainly felt like a flat performance with pretty much ever player (even Leon) guilty of some poor passing. This season has seen a progression for Swansea in pretty much every area which can be seen in the fact that there are far more options available and the team seems less fixed to 'Plan A'. 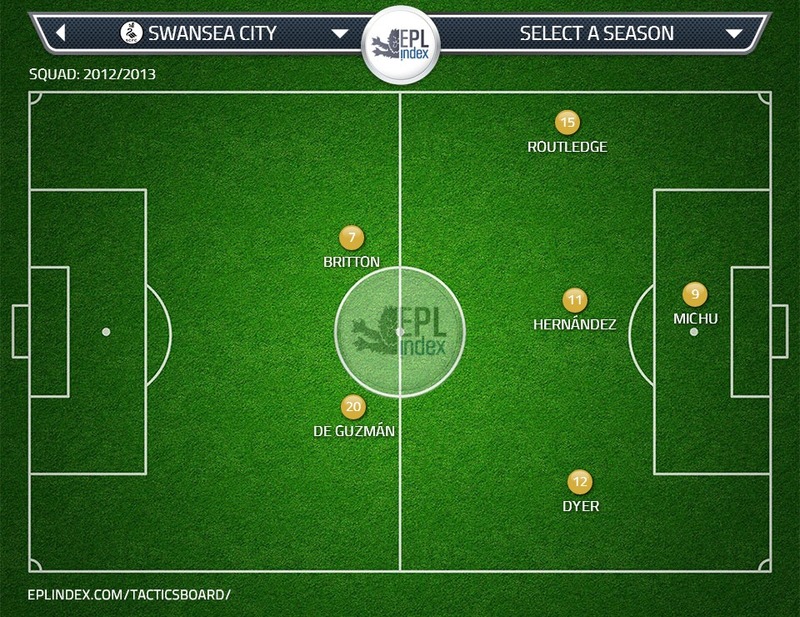 Option 1 - Essentially playing with Britton/Ki/De Guzman in midfield with Michu as lone striker. Against Arsenal Ki was the furthest forward of the 3. This is the most defensive line-up of the three. Option 3 - Play Michu as attacking midfielder with a more traditional striker (Graham/Shechter/Moore). I expect to see more of this option next season if a striker of suitable quality is bought in the summer. Roughly speaking Michu receives the ball twice as often when playing as an attacking midfielder rather than forward. As with Arsenal's visit, Spurs are under huge pressure in the hunt for 4th and Champions League football, it'll be interesting to see if Laudrup goes for a similar tactic of keeping things tight and hoping to exploit a team looking over-committing in the later stages looking for a win. Obviously it doesn't take a huge swing in chance conversion rate for the difference for Michu and Adebayor to disappear (3 more for Adebayor, 3 less for Michu and they'd both have 40% success rate) and some chances will be more clear cut than others but with 60% of premier league games being draws or single goal wins, little things can make a big difference.